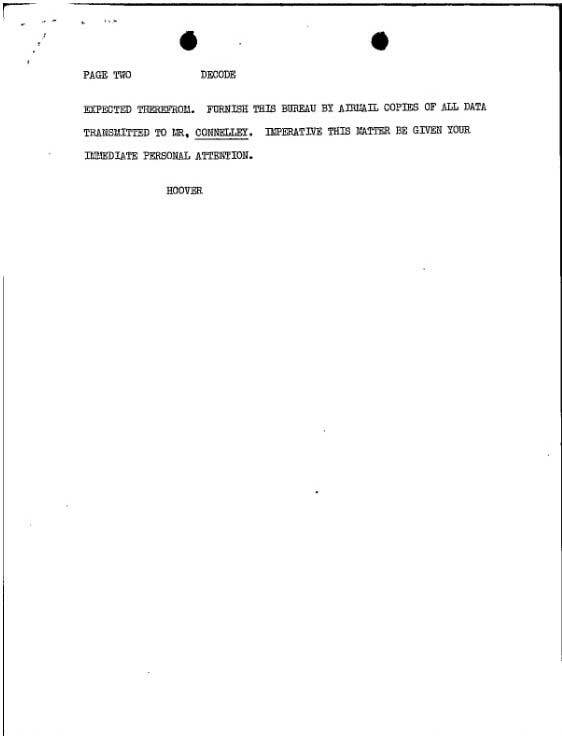 From the vaults of the FBI, here are some of the historical documents discussed in the book, from the warrant charging Harry Bridges to the infamous “Harry Dorgan” Communist Party Membership Book to once-secret government documents inked by J. Edgar Hoover himself. 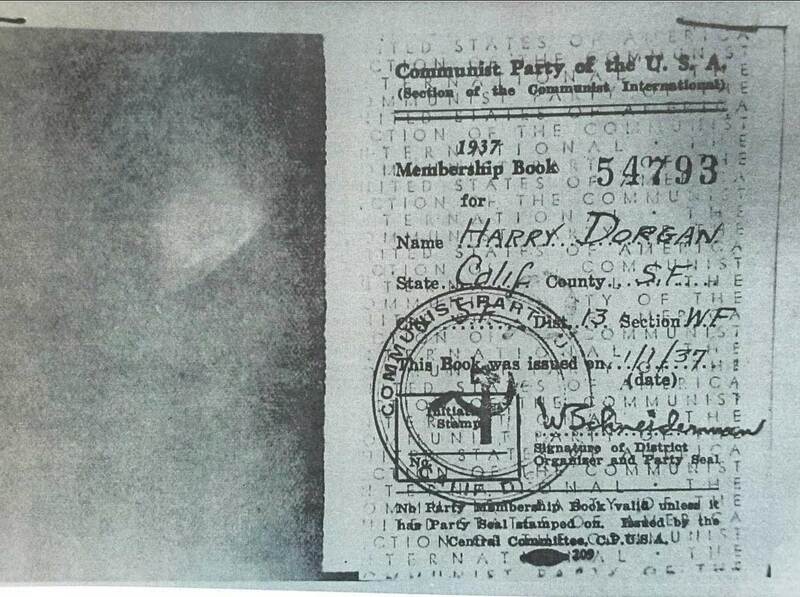 The infamous “Harry Dorgan” Communist Party Membership Card. It mysteriously appeared out of thin air in the 1930s at the hands of Harper Knowles. Many tried to allege that “Dorgan” was a code word for “Bridges.” But Knowles vigorously fought ever testifying in any trials as to the card’s alleged authenticity. It never constituted evidence in any of the trials. It now resides in the National Archives in San Bruno, California. 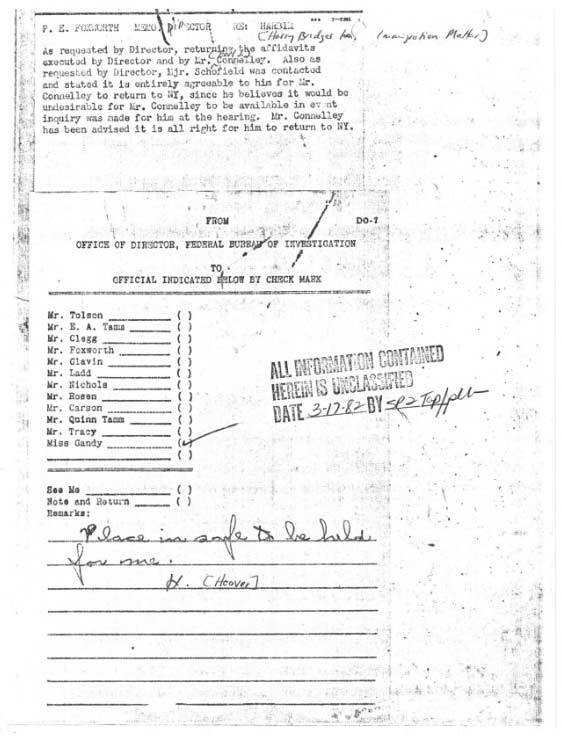 J. Edgar Hoover’s note to insure the already-executed affidavits were returned to him to be placed in his safe. 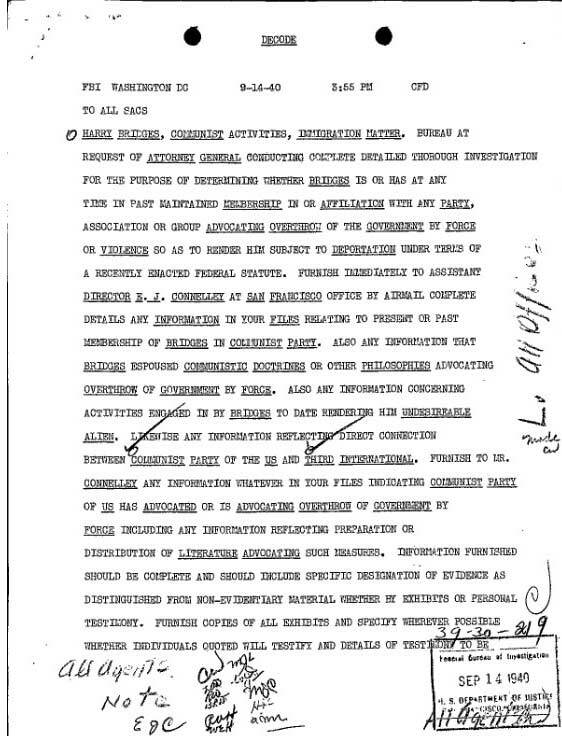 1951 FBI Memo to J. Edgar Hoover detailing secret confidential informants reporting on Bridges’ public speeches. To this day the secret informants remain classified. 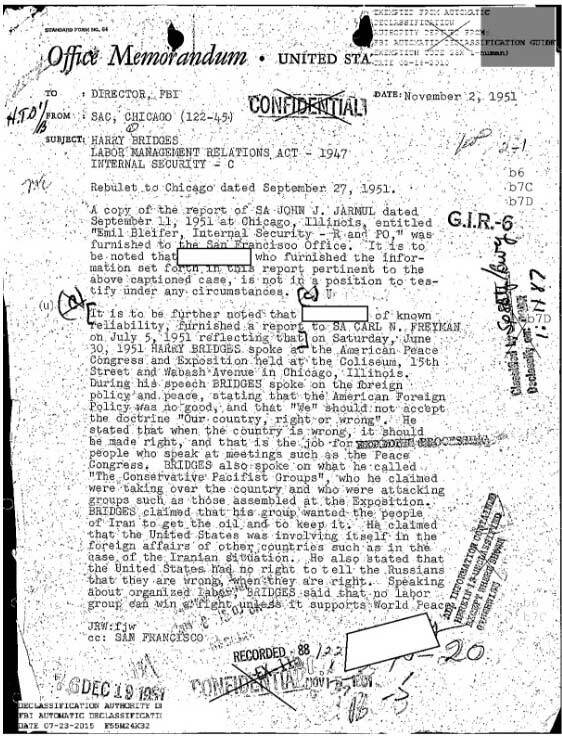 J. Edgar Hoover’s “Decoded” Memo to the FBI initiating the new investigation into Bridges in 1940 to identify any Communist connections. 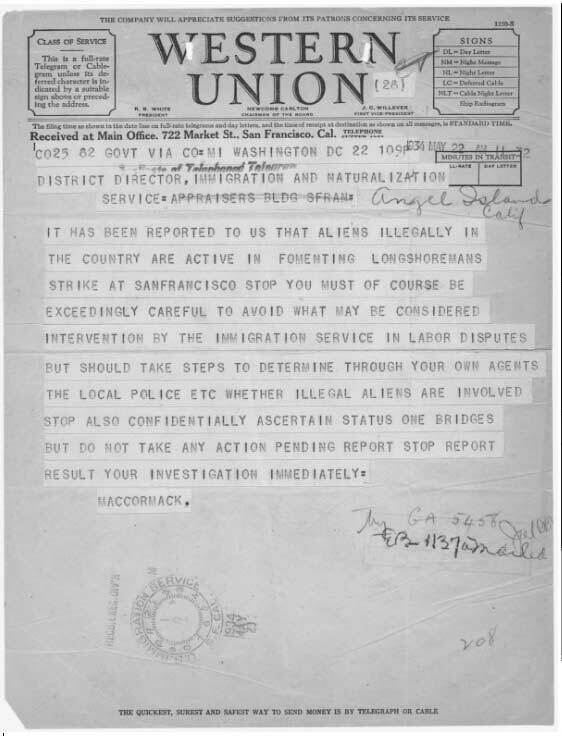 May 1934 urgent Western Union telegraph from INS Commissioner MacCormack to the San Francisco INS office to investigate whether “illegal aliens”–one Harry Bridges in particular–were involved in strike activities. 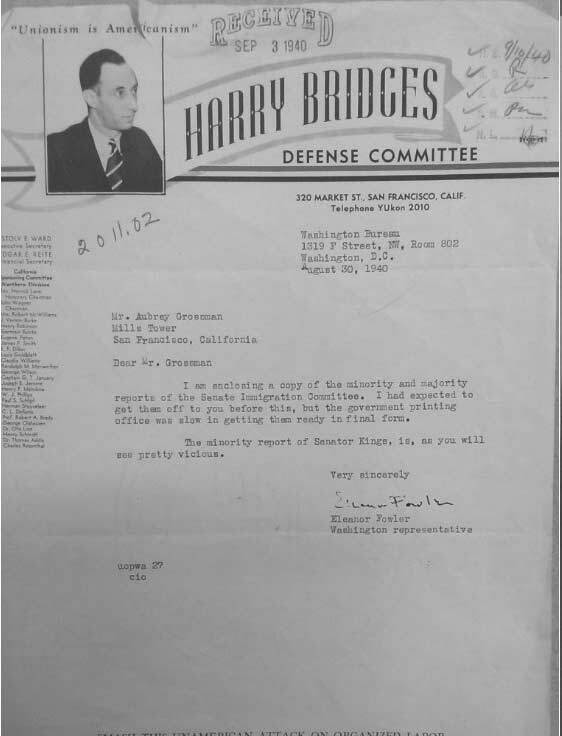 A letter from the Harry Bridges Legal Defense Committee. 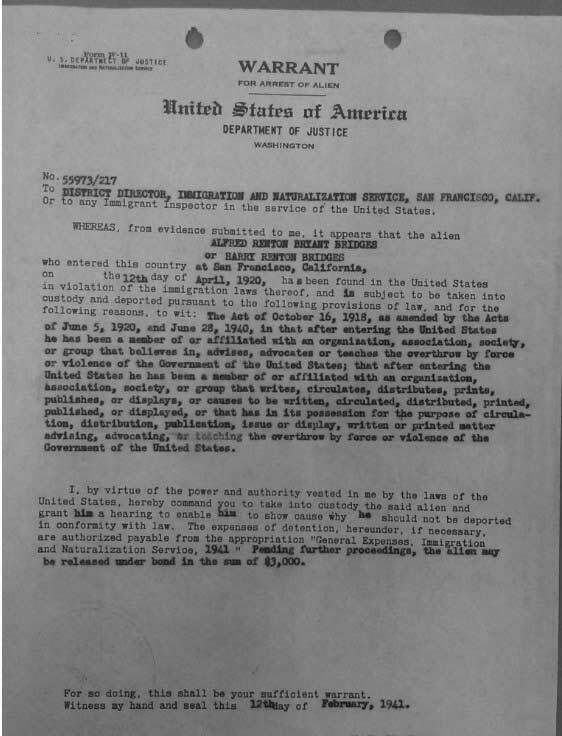 Ahead of the second deportation trial, this was the official Warrant issued by the Department of Justice for Harry Bridges’ arrest and deportation.